I could use the GIMP to invert the values in my original image, then save it as a separate file and have Boxcar Press make up a polymer plate from each file. In theory, I could print the first image in black as I had originally planned and then put the inverted value plate on the base and print it in a contrasting color, say silver or red. Or maybe it would be better to print the lighter color first and then the black image. This would, if it works, give me red or silver lettering and red or silver eyes in the sasquatch. The only fly in the ointment I could see is a registration problem. That would be no different from running a two-color or three-color composite image. I’m thinking that it just can’t be that simple can it? Am I missing something? 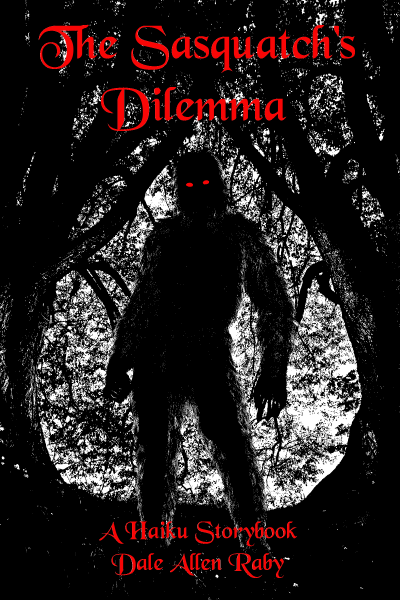 I’ve now created a new image that has only the lettering and the sasquatch’s eyes in the same same image area. If I get plates made and print that image in red, then the above image in black, I should get red lettering, a sasquatch with red eyes and “frosted” fur the same color as the paper and the paper bleed through between the tree branches… effectively, a three-color image with only two impressions, right? Right? Back in the day, they used to say “Well, it looks good on paper” when plans were being made. That was, of course when plans were actually made on paper and not in a computer file. These days, I suppose one might say “Well, it looks good in digital”… the implication being that even though it looks good as an image file, it might not work out so well on paper. I suppose, I could submit the image files, get the plates made and give it a shot. If I can’t make it work, then I still have the original file in black. Hey! I could make another image and give the sasquatch silver frost on his fur. Hmmm…. no, probably not. Attached file is a mockup of what I would like to achieve. red type will have to be fattened up to get any chance of fitting. they are translucent not opaque and will mostly make fattened image edges disappear in black. you should add a couple x registration marks on edge of sheet to help line up. Silver is just the opposite, silver, gold and metallic inks are very opaque. you should be able to photoshop out the type in the black just print solid black and print the silver on top normal sizes. all printing take a little trial and error to get what you like a few hours dry time to really see the final.look. 1. Make the canvas larger and put registration marks outside the print area of both images. 2. 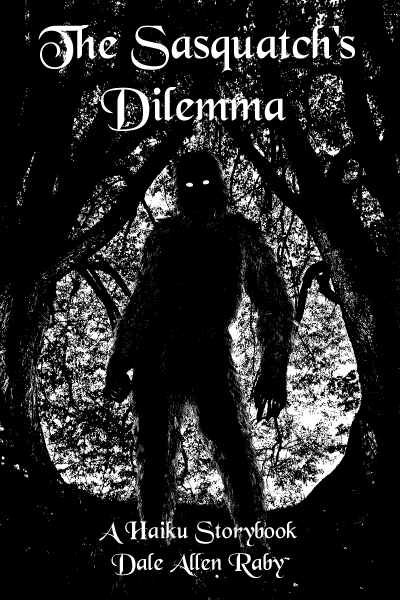 To do it in silver, print the black image without the type and remove the Sasquatch’s eyes. Then print the silver image directly on top of the black image. 3. I can’t really do red as it will have issues fitting into the white areas left by my original black image. If I make the eyes bigger and make the text bold, print that first, then print the black on top of the red? Would that work? You have to do a spread on the red or it will to trap to the black. This will make registration of the two colors easier. In the old days this was done with film. I am sure that Photoshop or adobe has this as a tool. Sorry, did not proof. That is you need to spread the red or silver image so it will trap to the black image. OK, to me “trap” either means a shooting sport you do with shotguns, something soccer players do with a ball or something you catch mice in. After a little Googling, I gather that it refers to printing over the top of one color ink with another color. I’m still not quite clear on what “trap to the black image” means, though. As I understand things so far, I can print with silver directly on top of black ink with no real issues, other than a longer drying time. Trying to do the same thing with red would not work because red is translucent, not opaque. If I print the red color first, then print the black image with the reversed out text and the reversed out sasquatch eyes, it should work, as I understand it. Making the text bold and the eyes a little bigger will make registration easier because the black ink (with smaller eyes and thinner text) will overprint the red. If I do it with silver, I need not worry about this because the silver will print over the top of the black ink with no issues. I’m starting to think that maybe this letterpress thing is actually more difficult to learn than blacksmithing was…. You might be able to outline the red type image with black to eliminate the problem in the areas that are not surrounded by black for the trapping. I think s slight black outline would be OK where the type abuts the white background areas and would allow you to expand the edge of the red images. Light has dawned… I see the problem now; making the text larger will cause it to “bleed” where it is printed on the white areas and there is no black to cover it up. Looking more and more like the best option would be to use an opaque like silver printed on top of black. Could still go with red sasquatch eyes as they are completely enclosed by black… but that would mean another plate for just a pair of red marks. Silver eyes in the black is probably just as chilling an image as the red, and silver lettering would be acceptable I think. Would be nice if I could just do the original idea of reversing the values and creating an image that would print red in the same areas left white on the original image. This is regarding printing just the eyes in red economically. I don’t know what kind of press or setup you have, but if you can print with type high linoleum cuts and/or type, you could cut a small lino block for the eyes, or if you have a couple of suitable periods, dashes, ornaments, etc in larger sizes of type, you might be able to use those. Since there is a lot of black around the eyes, you wouldn’t have to be very precise about setting that up because extra red printed area (within reason) would be hidden by the black. If you only use photopolymer, you might be able to cut a suitable piece out of an old plate, may part of a bold line or ??? Y’know, that IS a possibility. I do have some type-high maple blocks I had made up a while back which would work. I’ve also got a polymer plate around here that I could modify appropriately. Only issue would be getting it in the right place. It’s a press run of 200 or so that would ultimately be worth about seven bucks each and if I mess up I would not necessarily know about it until I started printing the black image. I’m thinking that for the cost of just one extra plate when discussing $1,400.00, I might wish to avoid the potential headache. Thanks, though, it was a good suggestion. Another thing to think about would perhaps trying one of the colored metallics. PANTONE have something like 300 metallic colors now, including reds. You might find one that would work and let you have opaque red in a single plate. I have thus far resisted the Pantone system… mostly because I am an old goat who will only accept a certain amount of change. I work in a gun shop and have my choice of whatever I want at the range. Mostly I shoot muzzleloaders with patched round balls. I suppose I will be dragged kicking and screaming into the future though and one day learn to mix ink and shoot ray guns. Your idea has merit though. I have some red and some silver… not Pantone, but compatible. Perhaps a little experimenting is in order this evening. If it works I might have to drag my reloading scale down and see how it works with ink. My biggest problem(s) right now is I have a deadline and am flat broke. I’m inclined to just print the single color and put off the multi-color projects until I have better learned this craft. The spread is required so that you can get a better or easier alignment of the two plates. Take your reverse image of the eyes and make it 2% bigger and then make the plate. This will allow some trapping to take place from the first run of red so that when the black image is printed you can overprint some of the red and trap it between the two colors.